Beatrice has a background in marine ecology and since her PhD she has worked to integrate different social science theories and methods with ecology to improve understanding of complex social-ecological dynamics. 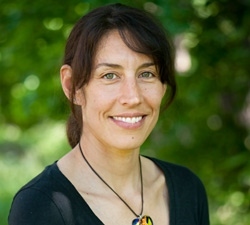 Within the Global Economic Dynamics and the Biosphere Program, she has led research efforts focused on understanding the role of seafood trade for marine resource governance outcomes from different angles, as well as examining links between the financial sector and the biosphere. The former involves examining how aspects of the seafood trade contribute to the ‘masking´ of signals of unsustainable use and the effects of this on governance at multiple levels. It also includes understanding how increasing market integration (and market mechanisms such as certification or FIPs) plays out at local levels of small-scale fisheries, creating traps or helping to alleviate poverty, and understanding the key role played by economic agents at multiple levels in the value chain in determining the trajectories of local social-ecological systems. The latter entails exploration of links between financial institutions and tipping elements in the Earth’s climate system, the role of finance and off-shore jurisdictions for the sustainability of global environmental commons such as forests and fisheries. Beatrice is also a theme leader of the ‘Patterns of the Anthropocene’ stream at Stockholm Resilience Centre.